I got a copy of the book from the authors in exchange of an honest review. Pointe of Breaking was nothing like I expected. When I read the synopsis, I though it’ll be like any other contemporary romance with a dancer and an Ivy League student with some feels. I never expected it to be a freaking messy, emotional, roller coaster ride. Adeline Parker doesn’t cone from money. She had to work hard for everything in her life. And dancing is her life. But after the way her relationship/ short-term engagement ended, she has been a mess. No matter how disappointing he is, Adeline can’t stop loving Blake. But when she finds out he screws with her despite being married, she’s had it. She decides to break of any and all relationship with him. Leo Richards hates ballet. His mother has taken him to a whole of ballet recitals, but he has never enjoyed them. Until he sees Adeline Parker on stage. She takes his breath away with her emotional performance. It doesn’t hurt that she’s hot as hell and he wants her for himself. But life is rarely that easy. Adeline’s past and Leo’s present are connected and not in a good way. This book, as I mentioned earlier was an emotional mess. It dealt with the ugly aspects of life and relationships. And the feels? Oh my God the feels in this book were chilling. There wasn’t a time in this book when you couldn’t be feeling some intense emotion all the time. Pointe of Breaking made me laugh, smile and more than anything, it made me ugly cry. 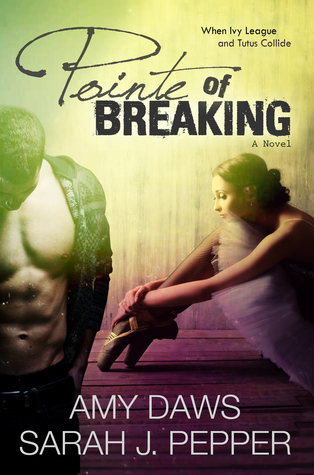 Pointe of Breaking is such an apt name for this book. Because both Adeline and Parker had reached their saturation point either when the book started or in the course of the book. Leo’s secrets made it difficult for him to live a happy life, and Adeline’s past refused to let go of her. Both Adeline and Leo were realistic characters. You could actually imagine something like that happening to any Jane/John Doe. But Adeline’s strength surprised me. I never though she would make it through after everything she had been subjected to. Leo on the other hand invoked mixed feelings. His secrets and some of his actions really hurt Adeline, and I hated him for it, but on the other hand, everything he did for her, to make her stronger, to protect her, made me love him. While there were characters I admired, there were also characters I despised. Blake was one of them. God that man was despicable. One of THE MOST selfish man I’ve ever read about. His arrogance knew no bounds. His actions were always self-serving and meant to hurt others. But thankfully he paid for his actions, though I wish his punishment was a little worse. Over all a very well written, character driven book with a lot of emotions. I would love to read another collaborative book by these authors. I like when I can love some of the characters and hate others. Keeps things interesting.